Are you looking for genuine online earning methods? There are too many methods are available on the internet, But most of the methods are a waste of time and give you less earning. 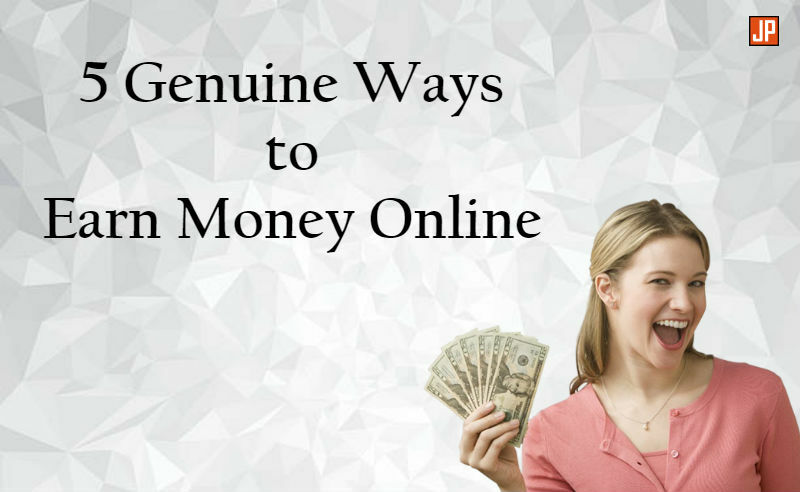 In this tutorial, I have found 5 genuine ways to earn money online where you can earn genuine money in less time and by smart work with your skill. Now let we take a full review of all the methods. Honestly, I have tried most of the online earning methods like survey jobs, captcha solving blah blah…, But I can’t get the proper results from any other methods except these 5 methods. I have tried these 5 methods personally by myself and I get the best results and day by day my earning is going up and up. Freelancing is the best genuine way to earn money online. If you are expert in any field like content writing, web designing or web development, SEO(Search Engine Optimization), Video making or editing, etc… then you can earn money by using your skills and make very good genuine income from freelancing. In the starting period, you have to work a little bit to earn a good ranking and reviews. But I promise when you get 10-15 reviews then no one can stop you. Earning will going up and up. You will find many genuine clients from freelancing platform and you will get more and more work from those clients. Here is the list of best freelancing websites where you can register and earn money online. Blogging is the second option to make genuine money online. Now you will raise some questions like what is a blog? and how we can start a blog? and how we can earn money from blogging? The answer is sharing your experience or any useful content/information to other people is called a blog. If you are an expert in any field or you love to travel then you can share your experience by blogging. You can share any tutorials like cooking, fitness, etc… You can get more information about how to make a blog here. After creating a blog you can fix a Google Adsense in your blog and make a genuine income. I want to ask you that earn money from blogging will take 6-12 months time because you have to work a little bit hard to make your blog popular. Make sure that good and useful content is the key success in blogging. If you will get success in blogging you will touch the sky. There are 2 ways to earn money from Affiliate Marketing. You can create a website/blog like an online store and promote products/services on your website. If people purchase any product through your website you will get a commission (10% – 20%). If you already have a website/blog and it has good traffic then you can fix the product link in your sidebar of a blog or any place on your website. There are many good and genuine affiliate providers on the market, I have listed some of them below. If you love to shoot video then it is the best and easiest method to earn money online quickly. You can shoot any video like a funny video, event video, tutorial video etc.. and upload it to the youtube channel, you will get genuine income from youtube. Is it free to make a youtube channel and upload videos? Yes, it is completely free of cost to make a youtube channel and upload videos. Youtube will show advertisement in your videos and pay you the commission. This is the easiest way to make money quickly and genuinely. You can sell any old products or your own created products like art products, jewelry, etc… You just need to make one website for online selling. If you like my post then comment below and share it with your friends.